Beverly Middle School's Science Fair is coming on Tuesday, February 26! Registration is open now. Click here to fill out the registration form so you can tell us about your wonderful self and what you're thinking about for a project (or if you don't know what you want to do yet)! Register by Friday 1/18 for a chance to win a $10 iTunes card. 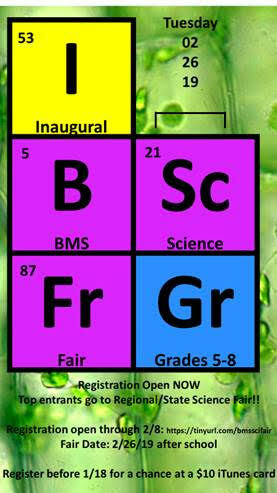 Registered participants can pick up their science fair notebooks from Mrs. Hopkins in room 131A or Mrs. Fish in room 339A. Trifold boards will be given out on January 23rd at 3:05 pm from the1st floor 1st Neighborhood Makerspace room. There will be two more after-school mentoring sessions before the Science Fair. Both are from 3:05-3:40 in the first floor first neighborhood Makerspace room. The sessions are open to all students to help you choose a topic and get started. Have fun exploring!! Mrs. Fish in room 339A (bfish@beverlyshcools.org) or Ms. Al-Khalili at reyaal67@gmail.com.